Honoring the award-winners at the 2018 ACHA Annual Meeting in Washington, DC are (from left): Richard Gribble (ACHA), Tim Meagher (ACHRC), Shane MacDonald (ACHRC), Maria Mazzenga (ACHRC). 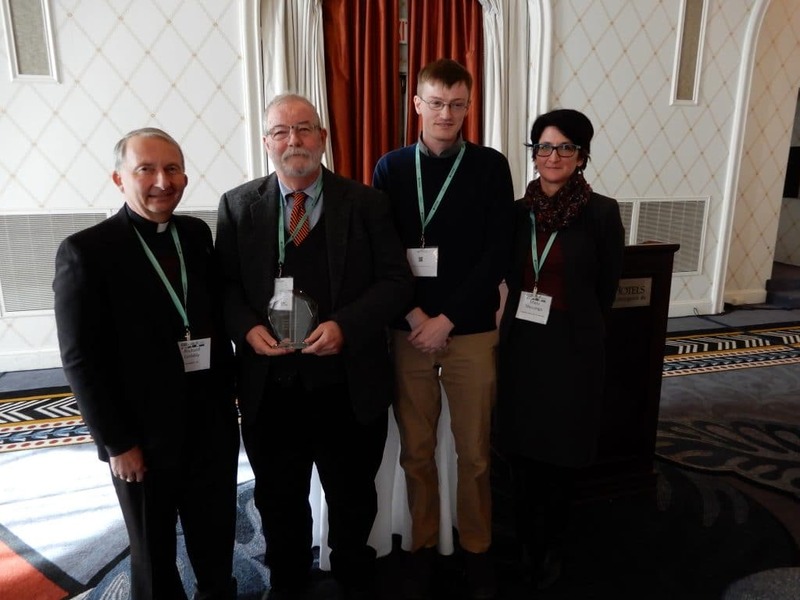 The American Catholic History Research Center and University Archives, The Catholic University of America was presented with the ACHA’s Distinguished Award for Service in January 2018 at the 2018 ACHA Annual Meeting in Washington, DC. The ACHA’s Distinguished Award for Service is presented to The American Catholic History Research Center and University Archives, The Catholic University of America, Washington, D.C. The ACHRC is awarded the Distinguished Service Award for the way it promotes Catholic scholarship, conservation, and preservation, which are varied, inventive and main stays. 1. Online Finding Aids: The ACHRC has posted 195 finding aids online, for records such as the US Conference of Catholic Bishops, the Catholic Daughters of the Americas, the John Ryan papers, and the records of organizations such as the National Catholic Education Association. 2. Digital Collections online: Over the past 15 years, the archives has worked to digitize collections materials to make them available to researchers throughout the world. We currently have 31 full or partially digitized collections available online, freely accessible to anyone with a computer. 3. Educational Materials: With the American Catholic History Classroom, the archives has posted hundreds of primary documents and photos from its collections, along with supporting essays and other resources for educators to use in teaching Catholicism. Currently, the archives hosts 25 such websites constructed by professional scholars. Topics cover race, politics, labor, and interfaith relations with the Catholic Church. 4. Blog Posts: Published 2-4 times a month, our blog, The Archivist’s Nook, informs scholars and the general public of new, unique, and novel aspects of our collections. Since 2015, the ACHRC has published 92 such posts on topics related to a variety of collection related materials, including, Mother Mary Harris Jones, to the records of the USCCB’s Office of Film and Broadcasting to the founding of welfare organizations such as Catholic Charities USA. 5. Conferences: Between 2013 and 2017, the archives has secured funding for three Catholic Archives in the Digital Age Conferences held on the Catholic University campus related to media and archives, teaching and archives, and religious order archives. All conferences have been free of charge to participants. And finally, through Mahler Grants: The Dorothy Mohler Research Grants help defray research and travel costs for those using the collections at the Archives. Every year we award two grants to scholars using the collections. It is for its devotion and dedication to the promotion and preservation of U.S. Catholic History that the American Catholic Historical Association is pleased to Award the 2018 Distinguished Service Award to The American Catholic History Research Center and University Archives, The Catholic University of America, Washington, D.C.